Microsoft appears to run on Outlook and Exchange. Seems like an obvious statement as many places run on Outlook and Exchange. But I'm saying it with emphasis. These guys used Outlook like it's an IM client. There's also a distribution list for everything. New job, new fresh email box, time to get organized and serious about ZEB (Zero Email Bounce.) You can't really get your Inbox to zero and stay there but you can "bounce" against zero, which I do a few times a day. If it's in your inbox it's not been processed. I use a "Getting Things Done" style of organization. I've got my folders laid out like this. I've got Outlook Rules for the Various Mailing Lists I've gotten myself on in the last few weeks. That's the other other "Inboxes" are for. The "Inbox - CC" folder is for when I'm cc'ed on an email. The actual Inbox itself is only for when an email is sent directly to me. Everything else goes somewhere else. The Action folders start with an @ sign and are at the top. There's things that require @Action that aren't projects. People to see and things to do on my @Next Redmond Trip. Emails I need to @Reply to that will take longer than 5 minutes to respond. There's things I'll do @Someday soon, but just not now. Things I'm @Snooze-ing on, but I'm not willing to move them completely out of mind. Finally there's things I'm @Waiting For other people do to for me. The Conversation History folder is where internal Instant Message conversations go. This is REALLY useful for reference. Missed IMs appear in the Inbox and are filed as needed. Then there's the Projects folder. These are long-running (more than a few days) projects that I'm actively working on. Emails that are important to those Projects go in those folders. It's pretty minimal reference stuff. The Reference folder is just that, it's Reference stuff. Things I'll want to search for later, and under it is the IT Issues folder which is also for reference, but specific to IT stuff I'm suffering with working through. When my inbox is at zero I do a quick sweep through my @ folders before continuing work on a Project. I really like Outlook 2007's calendaring and it grows on me more and more. I use colors to categories my appointments, but I also use multiple calendars more and more using the ICS Webcal standard. I've got four different calendars in addition to my standard calendar. One is fed from TripIt.com - I'll blog about them later, but they're freaking brilliant. One is fed from my wife and my Project at BaseCamp. We're building a house and we're managing the project, the move and appointments with many subcontractors via this tool and I'm subscribed to the Milestones in Outlook, and she in Google Calendar. One is from my publisher something we're working on. Note that the tabs are next to each other near the top (under where it says "October 2007"). 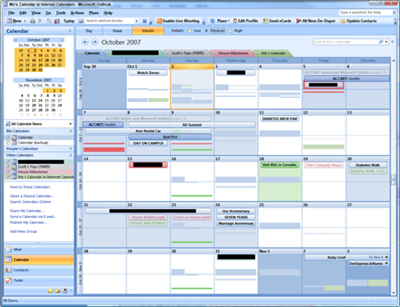 This way, rather than split-screen, each calendar is transparently overlaid over the other. I've found this to be a REALLY effective way of visualizing up to six different calendars while keeping each one separate. If you're not using this feature, I'd encourage you to check it out. The last thing I've done to make it easier for external folks to schedule meetings with me is I've made a redirect from http://www.hanselman.com/freebusy to my published Free/Busy information. This can be done by right-clicking on your calendar and publishing just the free/busy information to the Internet. I just made a single default.aspx file to rediect to the ultimate URL. This makes scheduling meetings with folks outside Microsoft just that much easier. Last and least, I've got a Windows Mobile phone and it's hooked up to Exchange and I've made the (difficult) conscious decision to only sync the "Inbox" and the "Inbox - CC" Folders to the device. The thinking being that there's little that's totally crucial that could happen on a Mailing List (as I don't yet own any) that would require my immediate and mobile attention. This system has worked for me so far - three-plus weeks. We'll see if it holds up under the weight of the unknown future. P.S. 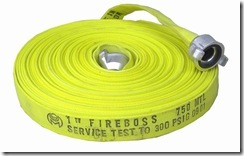 The fire hose child is not my son. Update: The flickr member who took the Fire House photo asked me to take it down. I replaced it with another. Bummer. Fair-use and copy-right is a confusing thing. I have three letters to express my thoughts on this one Scott, WTF! Wow Scott, the redacted text is just too intruiging. Let the guessing games begin! Projects/ASP.NET ______ is the new MVC framework. Projects/_______ is the Wrox project that also got redacted in the calendar. What combination of server-side and client-side software makes this happen? I currently use Trillian and FolderShare to archive/sync IM histories, but it's hacky and I can't convince anyone else to do it. Scott, your use of these blacked out areas makes your inbox and calendar look like a new form of sudoku! ;) I'm glad my Outlook isn't anywhere near that busy! I've gone the opposite direction with communication. Having fretted for some time over organizing email in folders etc. I embraced the idea that email is dead. Thus, everything goes in my inbox and stays there. I instead tag the messages (I use GMail as a mail client) and work entirely out of the inbox, archiving messages as I go. But in a bigger sense, most effective communication for me happens using RSS. When I need to communicate something, instead of email, I post to an appropriate collaboration tool. In some cases, I use social networking, but really, I'm not a big fan of the closed system. Using them, though, is still better in my situation than email, and I don't have to define the audience. So the stack looks something like this: Jive Software Clearspace as a collaboration platform at work, and Attensa (my employer) RSS tools for reading and publishing. Professionally oriented social network sites for conversation with colleagues, a private social space for personal communication, IM for direct conversation, and email as a last resort. The email has virtually disappeared, and RSS/tagging is a much easier way for me to organize/prioritize information. I don't envy you having to live in Outlook and Exchange! Scott, Eric used WTF in the 'Wow, Thats Fantastic!' manner, I'd assume. Geez man I am exhausted from reading this post! You must spend a lot of time mucking through your Inbox, sorting things out, writing rules, remembering the names of folders when looking for old emails, and other related activities. I said crap with it a long time ago. I give. I can't keep up. I just send it all to the Inbox and let Microsoft Search index everything. Saves me lots of time. Anyone else use this method besides me and Tony? These rules took all of 15 min to create. Making Rules in Outlook is a wizard. Come on people! How do you (if you do) sync multiple calendars to your Windows Mobile device? In my case I have my personal calendar, a department calendar in a Public Folder, my wife's calendar in Yahoo. How would you merge them all into your Inbox (so it could be synced with Windows Mobile)? I use SyncMyCal, but for you I'd probably suggest Plaxo since you use Yahoo. You should really watch that Scott. You should be scheduling more and @Someday'ing less. By the way I think there's a typo in your post: "I use colors to categories my appointments"
I have quite a similar structure, also because I have (always) too many projects running parallel. I make heavy use of the tool Speedfilter (http://www.claritude.com/products/sf/speedfiler-addin.htm) because most emails are not easy to store with a rule. So I read them, press ctrl-alt-V and store them using speedfilter. I found out that that is really working for me in order to get my Inbox empty. The biggest issue I still have is my @Waiting_for_Answer forlder, which tends to get all filled up and it's a real pain to make sure it is cleaned up regularely. Scot, I have been running successfully with a simialar system for a few months now. One addition you might find useful is a rule which flags mail sent only to you with a red flag. That rule helps me scan my inbox for mail that I really really need to do something with vs. mail that might be directed to a whole group of people. Scott, the BaseCamp link is dead. Interesting post, I have long struggled with the best way to organise data inside Outlook. I have tried a whole bunch of methods - GTD Addin, macros/rules that implement custom GTD functionality etc... could not seem to find a method that I was happy with. Inbox = stuff still to be done. Reference Folder = everything I'm done with. This does however mean that I have between 20 - 50 mails in my Inbox at any one time (no chance of ZEB) and I pay a lot of interest on the stuff sitting in there. Hey, how did you get the Calendars to show like that? I use a similar system but rather than use action (context) folders I use macros to create Outlook tasks from the email, then file the original email in the relevant project folder. This means that when I sync my Windows Mobile I get all my tasks without having to sync all my mail and the original email is already in the right folder when the task is complete. Regarding the issue of scheduling meetings with people outside your organization, have you seen the upcoming Tungle . It looks very interesting. I don't think the @ is for action, I think it's because Outlook sorts the folders alphabetically, so the ones with '@' in front get put up top. No? Oops - @ is for Action, I missed that on my first read-thru. Why would IM be a "terminable offense?" Although the distraction is regretable in many cases, it's been a useful tool over the last 7 or so years I've been on development teams. Using email in the place of IM means cruft and latency for disposable conversations, no? Can you explain the difference between @Action and flagging something as a task in Outlook? Why not put the emails into their respective project folders and flag them? Then use a search folder to find all flagged items. Also, where do items go after they're in @Action and have been completed? Just looking at your inbox stresses me out. What's the diff between @snooze and @someday? I guess it's because rather than view IM as a valuable means of communication and collaboration, it's viewed instead as preventing the employees from being productive because they'd be chatting with each other all day via IM instead of working. Great info, Scott!. Do you have any macros that you run to help automate the moving/labeling of email into the correct folders? I forgot one thing - how do you archive IM in email? Just a copy/paste and send it to yourself? As a fellow Microsoftie who uses a very similar system, I am curious how you are handling BCC's to distribution lists? They are the bane to my Outlook existence. Have you structured your Outlook rules in some way to catch these or are they making it to your inbox? I've tried several solutions, but nothing ever works quite right. Making my "Inbox - Lists" rules all "Stop processing rules", with a final rule that places all messages without me in To/CC into a special folder has worked, but making sure all my rules have the "stop processing rules" is an annoying step that is easy to forget and I would like to get rid of. You seem to be surprised that everything at MS revolves around Outlook/Exchange. That would be like being surprised that everyone working for Nike.....wears Nike's! My life seems so simple. I honestly don't know if I could handle all of....that. Wow. Just wow. How do you manage your "Sent Items" Folder? Or do you care? I don't care. I keep sent items along with the items I replied to. Hey Scott, it's good to see this all coordinated. I remember fighting with this like 2 years ago when on a contract at a client site. I essentially had 3 inboxes: Work, Client Work and Home along with the same three calendars. I wanted my Pocket PC / Cell phone to be the central holding spot for everything, but I just couldn't get everything to coordinate. I'm happy to see that you have it all together. Others may be shocked, but really, you have the system that most busy professionals should have, something to abstract out details and minimize the sheer volume of noise that you have to handle regularly. To all those that are wondering about "Conversation History" and IM's: Microsoft - this should come as a surprise to no one - internally uses the latest of the Office suite of stuff. Outlook 2007, when paired with Office Communicator 2007, gets the conversation threading/archiving/etc. behavior "automagically". Well Scott, I just had to come back and visit the comments again. There is definitely NO middle ground here. Everyone is either insane like you with tons of rules (automated or in-head) or doesn't give a crap and uses some sort of simple is stupid method. To each his own. As long as we all keep up with our responsibilities and crank out code I guess that's all "they" care about. Wow -- well I know this is effective for some people, but this is just *way* too much work for me! I'm more with Mr. Inbox-Only... but unlike Tony I live in Outlook and it generally works great. I use flags and color catogorization right there in the inbox, and I use rules to automatically route (most) DLs to a single "Discussion Lists" folder. The biggest issue I run into is the Inbox can get so big that it sometimes takes a little bit to index, search. I'm (I think) mitigating this by creating an archive file for each quarter (as in 3Q07). Ah, the "we're building a house" thing is interesting, but the link is dead. Fix it man! I'd also love to know how you're keeping costs and check, seeing how you're kind of freak when it comes to personal finance. Also, any design elements that you can share? Floor Plans? Home network wiring strategy? 1) does anybody know how to quickly or at all set a category for an email your are sending.. to me that would be a killer feature. I'd love to quickly put a category on items i am sending, and even have one category that basically means it even worth saving. I wish mobile outlook had abilities to have a whitelist , or patterns on when a notification would be played, and ability to have different sounds.. but i digress.. Interesting blog, and since reading it I've been spurred to make a system at work pretty similar, and so far I'm liking it a lot! Software - One folder for each tool with download links, keys, etc. That said, Flickr has a ton of photos (about 5.6 million, last time I looked) offered under a Creative Commons attribution license that allows derivative works and commercial use. You can use these on your website as long as you give credit to the photographer.